Cryptococcosis is the most common fungal infection of the central nervous system and may present as a space-occupying lesion, meningitis, or meningoencephalitis. In addition, cryptococcosis is the most common fungal disease in HIV -infected persons, and it is the AIDS-defining illness for 60-70% of HIV-infected patients. Cryptococcus neoformans spreads hematogenously to the CNS from pulmonary foci, which may be subclinical. No pneumonitis is found in more than 85% of patients with cryptococcal CNS disease. In addition to invading the lung and CNS, cryptococci also invade the skin, bone, and genitourinary tract, but meninges appear to be the preferred site. The reasons are not clear, but several suggestions have been made. 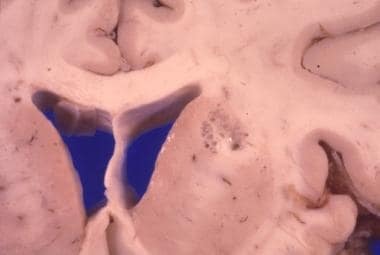 For one, cryptococcal capsule antigens may have limited ability to induce an inflammatory response in the cerebrospinal fluid. Furthermore, the alternative pathway of complement is absent in the CSF. By contrast, CSF is a good growth medium for the organism in culture, possibly because of trophic properties of dopamine and other neurotransmitters in the CSF and the absence of cryptococcus-toxic proteins. Cryptococcal disease usually develops only when CD4+ lymphocyte counts fall below 100 cells/μL. At this stage, macrophage function also is impaired. Immune reconstitution inflammatory syndrome occurs in some patients after treatment with highly active antiretroviral therapy (HAART). This syndrome is a paradoxical deterioration in the clinical status despite satisfactory control of viral replication and improvement of CD4+ counts as a result of an exuberant inflammatory response toward previously diagnosed or latent opportunistic pathogens. Of patients with AIDS in the United States, cryptococcal meningitis occurs more commonly in African Americans than in whites. However, a case-controlled study did not find an association between cryptococcal infection and race, suggesting that race may just be a surrogate for the presence of other conditions or exposures. CNS cryptococcosis is rare in children with AIDS. Cryptococcus neoformans is a round or oval yeast, 4-6 mm in diameter, surrounded by a 30-mm-thick capsule. Based on the polysaccharide wall serology, use of nutrients, and DNA sequence, it is subclassified into C neoformans neoformans and C neoformans gattii. Most HIV-associated cryptococcal infections are caused by Cryptococcusneoformans, serotype A (found worldwide), but occasionally Cryptococcus gattii is the cause (found in Australia, subtropical regions, and the Pacific Northwest). CNS cryptococcosis is fatal unless treated. Several studies report acute mortality rates of 6-14%. A minority of patients die within the first 6 weeks after diagnosis, despite treatment. Those who survive usually live for longer than 18 months. In addition, the rate of relapse after treatment is high (30-50%). Disease onset is usually insidious, which may be why the time from symptom onset to diagnosis is, on average, 30 days or more. The delay also may be due to the waxing-and-waning course and the nonspecificity of symptoms. Onset is rarely fulminant. Lung involvement is found in fewer than one third of patients with CNS cryptococcosis. Occasionally, evidence of unsuspected CNS cryptococcosis is detected on cerebrospinal fluid analysis done for other reasons. In almost half of patients, cryptococcosis in the CNS or elsewhere is the AIDS-defining illness. Occasionally, patients may experience focal neurologic symptoms or seizures. Focal signs may indicate that the infectious meningeal process has reached superficial layers of the cortex and cerebellum, or they may point to cryptococcomas (ie, cryptococcal abscesses), most commonly in the basal ganglia and cerebellum (see the images below). Magnetic resonance imaging showing a cryptococcoma in the medulla. Coronal section of brain showing a cryptococcoma in the basal ganglia. Mental status changes include confusion, psychomotor retardation, irritability, agitation, personality changes, and psychosis. Nuchal rigidity may be absent because of minimal inflammation. Hydrocephalus must be suspected with new-onset impaired consciousness, motor signs, nausea, vomiting, or visual impairment. This usually occurs late in the course of cryptococcosis. Bilateral visual loss also can result from arachnoiditis at the level of the optic nerves or cryptococcal invasion of the optic nerve. Occasionally, symptoms and signs of a radiculomyelopathy predominate because of spinal cord involvement. Patients may have radicular pain, stiffness or spasticity, limb weakness, sphincter disturbances, loss of sensation, and weakness. Measurement of opening pressure is an important aspect of lumbar puncture. Opening pressure is elevated to greater than 25cm H20 in approximately 60-80% of patients. [5, 6] CSF analysis may yield normal (ie, reference) results in 25% of patients and may be minimally abnormal in as many as 50%; therefore, identifying the organism via India Ink and serology is crucial. CSF fluid appearance can be clear or turbid. Protein levels exceed 45 mg/dL in one third to two thirds of cases, ranging from normal to 300 mg/100 dL. The glucose level is usually normal and is less than 60% of the serum level in only 17-65%. Mononuclear pleocytosis (>20 cells/μL) occurs in 13-31% of cases. Numbers vary between reports, but in one study, 55% of patients had fewer than 10 mononuclear cells/μL. Close to 100% of CSF culture results are positive for Cryptococcus neoformans, whereas 55% of blood culture results are positive. India ink stain is positive in 60-80% of infected patients but many labs in the United States no longer perform this test. Testing for CSF and serum cryptococcal antigen (CrAg) may be diagnostic with a sensitivity of 94.1% and 93.6%, respectively; a negative test should not be used as a rationale to discontinue treatment. CrAg may be present weeks to months before symptom onset  and a positive serum CrAg warrants a lumbar puncture to assess for meningeal infection. Antigen is detected via latex agglutination, enzyme immunoassays, and lateral flow assay. Testing for CrAg in the serum is a useful initial screening tool in HIV-infected patients. A positive titer is sufficient to initiate therapy while cultures are pending in the appropriate clinical setting. CT scan is acceptable as a screening study, but MRI, with and without contrast, is the preferred imaging modality. CT scan findings may be nonspecific or normal. Cryptococcal pseudocysts may appear as nonenhancing, hypodense lesions on CT scan. 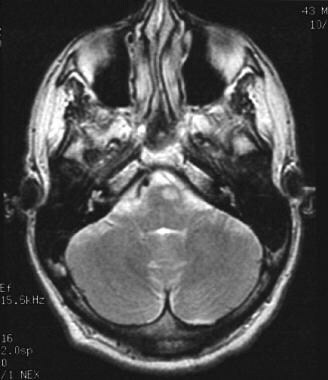 With MRI, T1-weighted images may show low-intensity lesions in the basal ganglia, which are hyperintense on T2-weighted images and may enhance with gadolinium. Twenty to thirty percent of patients show meningeal enhancement, parenchymal solid mass lesion without hemorrhage (granuloma), atrophy, cerebral edema, or hydrocephalus (see the image below). Commonly, in patients with increased intracranial pressure, the ventricles are small. If the imaging studies show a cryptococcal mass lesion (ie, cryptococcoma), toxoplasmosis and lymphoma must be considered in the differential diagnosis; brain biopsy may be indicated. This image shows meningeal enhancement in a patient with cryptococcal meningitis. The meninges are opaque, and a capsular material may fill the subarachnoid space. Mixed meningeal infiltrates consisting of lymphocytes, eosinophils, plasma cells, multinucleated giant cells (containing phagocytized organisms), and neutrophils may surround clusters of organisms and sometimes form granulomas, but often the inflammatory response is scant. Cryptococci extend along Virchow-Robin spaces into the brain. 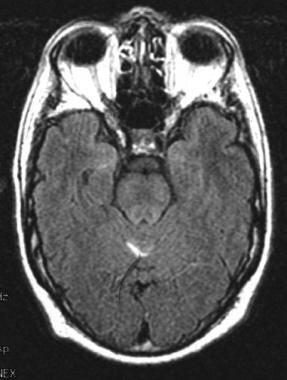 Parenchymal tubercles consisting of pseudocysts filled with organisms without significant inflammatory response, capsule formation, or gliosis are observed most often in the basal ganglia and cortical gray matter, but they may also be found elsewhere. If left untreated, cryptococcal CNS infections are fatal. Treatment with amphotericin B, flucytosine, fluconazole, and other antifungal agents greatly improves the prognosis, but a mortality rate of 6%, despite therapy, has been reported. Flucytosine should be adjusted in renal impairment. Serum flucytosine levels should be monitored 2 hours post-dose, after 3-5 doses. The drug concentration should be between 25-100 mg/L. Patients on amphotericin B should be monitored for dose-dependent nephrotoxicity and electrolyte disturbance. Consolidation therapy can begin 2 weeks after successful induction therapy, which occurs with clinical improvement and negative CSF culture. The IDSA preferred regimen is fluconazole 400mg PO or IV once daily for at least 8 weeks. Alternatively, can use itraconazole 200mg PO twice daily. In a randomized study that compared 1 mg/kg versus 0.7 mg/kg of amphotericin B in HIV-infected patients with cryptococcal meningitis, the higher dose was more rapidly fungicidal; side effects were comparable. Patients in both arms of the study also received flucytosine, 25 mg/kg 4 times daily. Lifelong secondary prevention may be required. Relapses occur if secondary prevention is stopped or becomes ineffectual. Relapse rates without prevention range from 15–27%; and from 0–7% with antifungal prophylaxis. Discontinuing secondary antifungal prophylaxis may be considered in selected patients who have responded well to highly active antiretroviral therapy (HAART), with 12–18 months of successful suppression of HIV viral replication. This remains controversial. Criteria for discontinuing antifungal suppressive therapy during HAART, according to IDSA guidelines, are maintenance of a CD4+ cell count above 100 cells/µL and an undetectable or very low HIV RNA level for 3 months or longer (minimum of 12 months of antifungal therapy). The guidelines advise considering reinstitution of maintenance therapy if the CD4+ cell count falls below 100 cells/µL. Opening pressure is elevated to greater than 25cm H20 in 60–80% of patients with AIDS and cryptococcal CNS infection. [5, 6] This is probably due to obstruction of the basal meninges or impaired CSF absorption. Since increased intracranial pressure is a prognostic factor whose correction leads to symptomatic improvement, this must be managed aggressively. In the presence of cryptococcal immune reconstitution inflammatory syndrome (IRIS) ART and antifungal therapy should be continued. Seizures should be treated with standard therapy. Drugs that are less likely to affect bioavailability of highly active antiretroviral therapy (HAART) agents or anticryptococcal therapy are preferred. Cognitive impairment may improve with successful anticryptococcal therapy. On a case-by-case basis, the presence of a cryptococcoma may lead to consideration of surgical intervention. Rare visual loss due to local arachnoiditis or cryptococcal invasion of the nerves can be approached by nerve sheath decompression. What is CNS cryptococcosis in HIV infection? What is the pathophysiology CNS cryptococcosis in HIV infection? What is the prevalence CNS cryptococcosis in HIV infection? What causes CNS cryptococcosis in HIV infection? What is the prognosis of CNS cryptococcosis in HIV infection? Which clinical history findings are characteristic of CNS cryptococcosis in HIV infection? What are the signs and symptoms CNS cryptococcosis in HIV infection? Which CSF analysis findings are characteristic of CNS cryptococcosis in HIV infection? What is the role of CT scan and MRI in the workup CNS cryptococcosis in HIV infection? Which histologic findings are characteristic CNS cryptococcosis in HIV infection? How is CNS cryptococcosis treated in HIV infection? What is included in the maintenance therapy for CNS cryptococcosis in HIV infection? How is relapsed CNS cryptococcosis treated in HIV infection? How is increased intracranial pressure due to CNS cryptococcosis treated in HIV infection? How are the complications of CNS cryptococcosis treated in HIV infection? Hajjeh RA, Conn LA, Stephens DS, et al. Cryptococcosis: population-based multistate active surveillance and risk factors in human immunodeficiency virus-infected persons. Cryptococcal Active Surveillance Group. J Infect Dis. 1999 Feb. 179(2):449-54. [Medline]. Mirza SA, Phelan M, Rimland D, et al. The changing epidemiology of cryptococcosis: an update from population-based active surveillance in 2 large metropolitan areas, 1992-2000. Clin Infect Dis. 2003 Mar 15. 36(6):789-94. [Medline]. Pappas PG, Bustamante B, Ticona E, et al. Recombinant interferon- gamma 1b as adjunctive therapy for AIDS-related acute cryptococcal meningitis. J Infect Dis. 2004 Jun 15. 189(12):2185-91. [Medline]. Park BJ, Wannemuehler KA, Marston BJ, Govender N, Pappas PG, Chiller TM. Estimation of the current global burden of cryptococcal meningitis among persons living with HIV/AIDS. AIDS. 2009 Feb 20. 23(4):525-30. [Medline]. Graybill JR, Sobel J, Saag M, et al. Diagnosis and Management of increased intracranial pressure in patients with AIDS and cryptococcal meningitis. The NIAID Mycoses Study Group and AIDS Cooperative Treatment Group. Clin Infect Dis. Jan 2000. 30:47-54. [Medline]. [Full Text]. Biconic T, Brouwer AE, Meintjes G, et al. Relationship of cerebrospinal fluid pressure, fungal burden and outcome in patients with cryptococcal meningitis undergoing serial lumbar punctures. AIDS. Mar 27 2009. 23(6):701-706. [Medline]. [Full Text]. Nussbaum JC, Jackson A, Namarika D, Phulusa J, Kenala J, Kanyemba C. Combination flucytosine and high-dose fluconazole compared with fluconazole monotherapy for the treatment of cryptococcal meningitis: a randomized trial in Malawi. Clin Infect Dis. 2010 Feb 1. 50(3):338-44. [Medline]. [Full Text]. Loyse A, Wilson D, Meintjes G, Jarvis JN, Bicanic T, Bishop L, et al. Comparison of the Early Fungicidal Activity of High-Dose Fluconazole, Voriconazole, and Flucytosine as Second-Line Drugs Given in Combination With Amphotericin B for the Treatment of HIV-Associated Cryptococcal Meningitis. Clin Infect Dis. 2011 Nov 3. [Medline]. [Guideline] Perfect JR, Dismukes WE, Dromer F, et al. Clinical practice guidelines for the management of cryptococcal disease: 2010 update by the infectious diseases society of america. Clin Infect Dis. 2010 Feb 1. 50(3):291-322. [Medline]. [Full Text]. Bicanic T, Wood R, Meintjes G, Rebe K, Brouwer A, Loyse A. High-dose amphotericin B with flucytosine for the treatment of cryptococcal meningitis in HIV-infected patients: a randomized trial. Clin Infect Dis. 2008 Jul 1. 47(1):123-30. [Medline]. Perfect JR, Marr KA, Walsh TJ, et al. Voriconazole treatment for less-common, emerging, or refractory fungal infections. Clin Infect Dis. May 1 2003. 36 (9):1122-1131. [Medline]. [Full Text]. Pitisuttithum P, Negroni R, Graybill JR, et al. Activity of posaconazole in the treatment of central nervous system fungal infections. J Antimicrob Chemother. Oct 2005. 56(4):745-755. [Medline]. [Full Text]. Boulware DR, Bonham SC, Meya DB, Wiesner DL, Park GS, Kambugu A, et al. Paucity of initial cerebrospinal fluid inflammation in cryptococcal meningitis is associated with subsequent immune reconstitution inflammatory syndrome. J Infect Dis. 2010 Sep 15. 202(6):962-70. [Medline]. [Full Text]. Newton PN, Thai le H, Tip NQ, et al. A randomized, double-blind, placebo-controlled trial of acetazolamide for the treatment of elevated intracranial pressure in cryptococcal meningitis. Clin Infect DIs. Sep 15 2002. 35(6):769-772. [Medline]. [Full Text]. Antinori S, Radice A, Galimberti L. The role of cryptococcal antigen assay in diagnosis and monitoring of cryptococcal meningitis. J Clin Microbiol. 2005 Nov. 43(11):5828-9. [Medline]. de Gans J, Portegies P. Neurological complications of infection with human immunodeficiency virus type 1. A review of literature and 241 cases. Clin Neurol Neurosurg. 1989. 91(3):199-219. [Medline]. Gendelman HE, Lipton SA, Epstein L. The Neurology of AIDS. New York: Chapman & Hall. 1998. Kaplan JE, Hanson D, Dworkin MS, et al. Epidemiology of human immunodeficiency virus-associated opportunistic infections in the United States in the era of highly active antiretroviral therapy. Clin Infect Dis. 2000 Apr. 30 Suppl 1:S5-14. [Medline]. Quality Standards Subcommittee of the AAN. Evaluation and management of intracranial mass lesions in AIDS. Report of the Quality Standards Subcommittee of the American Academy of Neurology. Neurology. 1998 Jan. 50(1):21-6. [Medline]. Said G, Saimont AG, Lacroix C. Neurological complications of HIV and AIDS. Philadelphia: WB Saunders. 1998. Schwartz P, Janbon G, Dromer F. Combination of amphotericin B with flucytosine is active in vitro against flucytosine-resistant isolates of Cryptococcus neoformans. Antimicrob. Agents Chemother. 2006. 51:383-85. [Medline]. Skiest DJ, Hester LJ, Hardy RD. Cryptococcal immune reconstitution inflammatory syndrome: report of four cases in three patients and review of the literature. J Infect. 2005 Dec. 51(5):e289-97. [Medline]. Sloan D, Dlamini S, Paul N, Dedicoat M. Treatment of acute cryptococcal meningitis in HIV infected adults, with an emphasis on resource-limited settings. Cochrane Database Syst Rev. 2008. (4):CD005647. [Medline].